Hi everyone. Yesterday I was experimenting with some metallic paints that I just purchased. They are made by Tsukineko and are an all-purpose ink that washes up with water, but also forms a resist surface on paper (and fabric). I poured a few drops on my craft sheet and used a scrunched piece of plastic wrap to pounce the copper onto my white panel. Once dry, I randomly sponged the panel with deep yellow and orange (faux mother-of-pearl technique). I die-cut a butterfly from a heated piece of copper and placed on the panel ... yuck! :) The colors just didn't work. The orange was good, but the butterfly has lots of pink as well (no yellow tones), so I sponged over the yellow sections of my panel with pink ink and it turned out really pretty. It's very close to the color of the butterfly. In fact, in the photo, they look like they match perfectly. I love the tone-on-tone of this card. I kept it very CAS by just adding a stamped sentiment. The sentiment shows up nicely, but you'll see in the close-up below that the ink doesn't stamp perfectly over the copper portions of the card, so it's a little faded in places - I like how it turned out. I'm entering this into the current challenge at CAS-ology #94. Perfect for that challenge! Love the way you did the background. Such a pretty card Loll. Love the scrunched cling film background. The colours work so well together. Very pretty, Loll!!! I love how you always use interesting techniques and/or materials on your CAS cards. 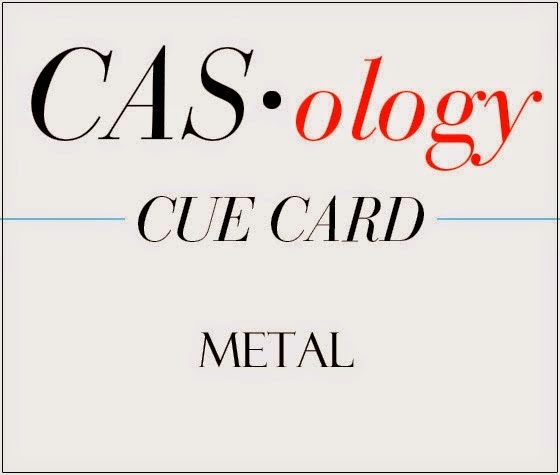 So many CAS card makers seem to be of the opinion that it's not clean and "simple" if you use artsy techniques. But you seem to have the same attitude that I do in that you want every card to have something special about it. I don't always achieve that, but it certainly makes me happier with my cards when I do. 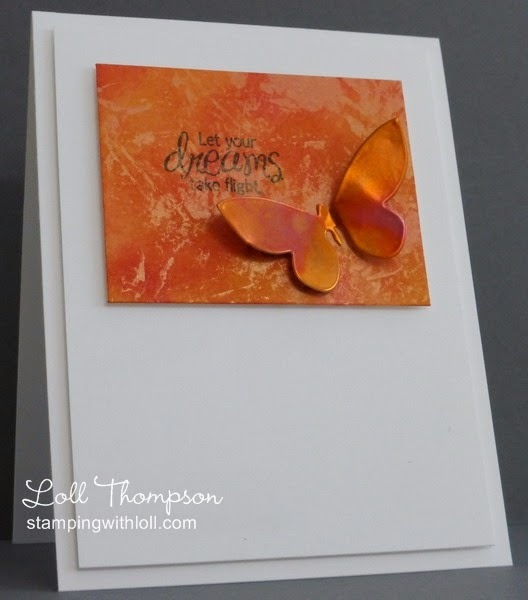 What a beautiful background and a perfect match for your heated copper butterfly! Love it! Gorgeous background, and I love the butterfly...so striking! Hi Loll, Just enjoyed your later w/color cards. I'm always amused that you are 'not so satisfied' with how they turned out, and I think each one is just fabulous!!! You're being way too hard on yourself,because each one is a jewel. Of course I'm loving this last one with the metallics. Is this the Pico inks? I have some of those ordered - thanks to Miss Lynn. This one is a stunner too. Loved the picture of Cooper...what a cutie. I'm sure the photo album was the best treasure received that day. TFS & Hugs. And your watercoloring is just fine IMHO! I finally got to see Day 2 video. Hope to catch up with the remaining ones this week. 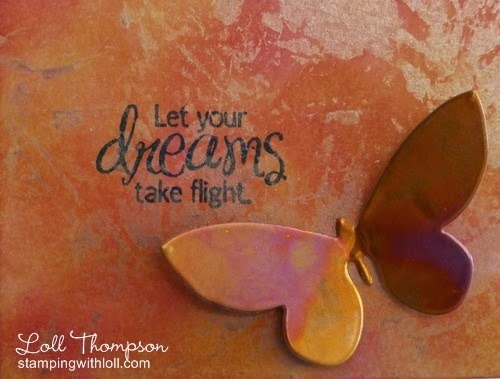 Oh, this is stunning...love the background for your butterfly! LOVE!